Nashville Hot and Georgia Gold fried chicken are back at KFC for the near future and are being promoted with yet another new celebrity Colonel. 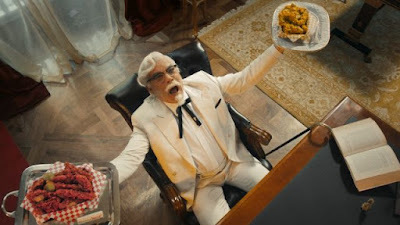 This time around they've hired actor Ray Liotta (best known for his role in the movie Goodfellas) to play a version of the Colonel that is split (personality that is) between the two fried chicken flavors. Both Nashville Hot and Georgia Gold are available in Extra Crispy Tenders, Chicken Littles, and Extra Crispy Fried Chicken. Nashville Hot features a cayenne-based spicy, smoky flavor, while Georgia Gold features a honey mustard barbecue profile.